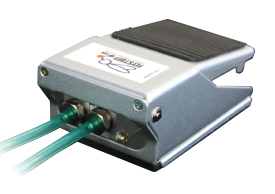 Designed for working with your Drosophila Anesthesia Network. A solid 1/8 in ID (3 mm) hose barb tube connector fits our standard size tubing. The single-stage regulator (Cat # 59-142) is made of chrome plated brass. 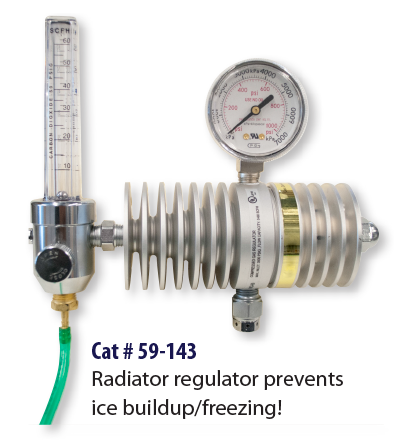 The CO2 Radiator Regulator/Flowmeter (Cat # 59-143) is excellent for heavy gas flow with multiple fly station setups and is specially designed to help prevent freezing. Bubblers help prevent your flies from becoming dehydrated while also helping in the reduction of static electricity on your Flypad. Genesee’s new bubbler attachment heads come in three convenient sizes to fit standard 500 ml, 1000 ml, and 2000 ml Erlenmeyer flasks. 2 x 3 ft coil tube included. Flask not included. You’ll never go back! The new conductive, black Flypad surface is another exclusive from Genesee Scientific and offers several advantages over the traditional white surfaces of flypads. The conductive porous material helps to reduce static buildup on the Flypad and reduces glare when viewing flies under a microscope. This black surface provides unmatched contrast so viewing your flies is better than ever. The Ultimate FlyStuff Flypad is made of 1/8 in (3 mm) easily replaceable UHMW porous polyethylene paired together with metal casing which helps in reducing static. A precision routed maze along the metal casing assures optimal, consistent diffusion of CO2 throughout the staging area. The FlyStuff Ultimate Flowbed features 3 input options to best suit your setup. 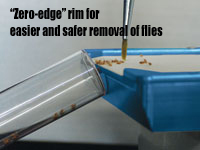 Its ‘zero-edge’ rim makes it easy and safe for removal of flies. For instructions on replacing the surface of the Ultimate Flypad, Click Here. The Flystuff Flypad is made of 1/8 in (3 mm) UHMW porous polyethylene fused to 3/4 in (12 mm) acrylic base. The precision routed maze maintains a flat, warp-free surface and also assures optimal, consistent diffusion of CO2 throughout the staging area. The Flystuff Flypad features a nickel-plated brass threaded hose barb input that fits 1/8 in ID (3 mm) tubing (substitute fitting for 1/4 in (6 mm) ID tubing available upon request). We also provide Flypad resurfacing in our in-house machine shop. The Flystuff Flypad Frame is a white acrylic frame with a precision routed recessed groove that fits precisely on top of the Flystuff Flypad. The fit allows for easy one-handed removal, and the recessed gravity fit keeps the frame securely in place when in use. The benefit of this frame is two fold: 1) CO2, being heavier than air, is more efficiently contained within the frame. This is especially beneficial when the Flystuff Foot Valve is used. 2) The frame adds protective walls to the Flypad surface to best contain flies and assure that they will not inadvertently be swept off the Flypad. *Each Ultimate Flypad comes with 2 additional replacement pads (with pre-applied adhesive tape), hex wrench, 5 feet of Genesee tubing, 2 threaded plugs, 1 (one) 1/8 in I.D. (3 mm) threaded input, and 1 (one) 1/4 in (6 mm) I.D. threaded input. We adapted technology from the semiconductor and other electrostatic-sensitive disciplines to your flyroom. Introducing 2 new brushes to help control static electricity using grounded conductivity. It starts with a superconductive specialized bristle fiber filament that is chemically bonded with copper sulfide to produce a corona discharge effect. When this fiber nears the surface of static charged material, it will ionize the air, which acts as a carrier of electrons away from the charged materials. For a demonstration video, Click Here. 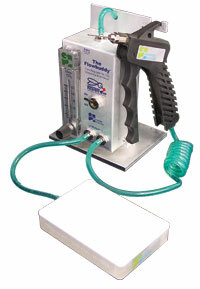 The Flowbuddy Flow Regulator adds convenience and precision flow control to any CO2 Drosophila workstation. The Flowbuddy’s toggle switch is used to instantly start and stop fly work with ease. CO2 flow to the 2 barbed outputs is adjusted with the Flowbuddy’s knurled knob flow regulator which allows effortless, user-determined micro adjustment in LPM (Liters Per Minute) with constant, visible confirmation on the flow meter. Since the Flowbuddy Flow Regulator withstands input pressure up to 100 psi, tank gauges can safely be left open, which eliminates the need to fuss with the tank’s knobs and levers to begin and end fly work. Even when CO2 pressure increases or decreases (i.e. when another workstation on the network is shut off or turned on), the Flowbuddy’s Flow Regulator will maintain a consistent unvarying flow. The Benchtop Flowbuddy Flow Regulator features a sturdy base, non-slip feet, gun hook, and has a small footprint (just 4×6 inches!) to fit nicely on a workstation surface. The Wall-Mount Flowbuddy Flow Regulator is engineered for simple, sturdy installation (hardware included) to free up bench space. The barbed input and outputs are nickel-plated solid brass and fit 1/8 in I.D. (3 mm) tubing. The FlyStuff pistol grip blowgun offers variable flow control and is lightweight, ergonomic and the perfect complement to any CO2 anesthetizing apparatus. The output is a 0.05 in (1.27 mm) stainless steel needle tip with a nickel plated brass base. The needle length measures 1 3/16 in (30.16 mm), which is ideal for use with cotton, rayon or Flugs. The barbed input is a solid brass 1/8 in I.D. (3 mm) and fits our standard size tubing. The Flystuff Foot Pedal is a simple and efficient tool designed to conserve CO2 and reduce the risk of over-anesthetizing flies. When compared to a standard continuous-flow setup, the addition of this simple foot valve to your Drosophila workstation can conserve CO2 by 500% or more. This can translate into huge savings. In addition to saving on CO2 cost, the Flystuff Foot Pedal saves the time and tedium involved in having to frequently change out CO2 tanks. The solid brass barbed input and output fit 1/8” I.D. tubing. The Flystuff Complete foot pedal system includes: 1 foot pedal; 1 Flypad; 1 Flypad frame; 5 ft 1/8 in ID (3 mm) Tubing; 1 “T” Fitting; 1 Blowgun with coiled tube and 0.05 x 1 3/16 in needle (0.72 x 1 3/4 in can be substituted free upon request). This high quality porous polyethylene is used in our in-house machine shop to manufacture the Flystuff Flypad. We have made this product available to the Drosophila research community so that they may make their own apparatus or resurface existing apparatus; however, please note that we can resurface (cat# 59-108) virtually any apparatus. Please contact us for details. Genesee Tubing is extremely flexible, resistant to kinks and can handle pressures of up to 57 psi on 1/8 in (3 mm) ID single barbed fittings. “T” Fittings are single-barbed and fit 1/8 in (3 mm) ID tubing.